Thanks to our good friend Dr. Karen Becker over at Mercola.com for this excellent article! His objection seems to be that along with all the crazies on the Internet, the pet food industry is now also promoting the ridiculous notion that dogs aren’t all that different from wolves, and should be fed like them. Interestingly, he’s really only objecting to Big Pet Food marketing campaigns, because in reality, these companies are simply using marketing hype to convince consumers to buy products that are about as far removed from the canine ancestral diet as it gets. They aren’t actually producing biologically appropriate, meat-rich, high-protein and low-carb diets — they’re just using packaging and marketing that gives the impression that’s what they’re selling. The tiresome “there’s no science” excuse is always used by the pet food industry and other processed pet food advocates to argue against species-appropriate fresh food diets for dogs and cats. They know full well there’s no science because such studies cost big money, and Big Pet Food has no interest in funding research that might (and in my opinion, would definitely) prove there’s a better way to feed pets than out of a bag or a can. “Although dogs are descendants of wolves, their domestication by humans led them to evolve from a mainly carnivorous diet to foods rich in starch. In 2013, Axelsson et al. conducted whole genome sequencing of both dogs and wolves to identify genetic variants occurring through the domestication of dogs. The 2013 study he’s referring to, which is titled “The genomic signature of dog domestication reveals adaptation to a starch-rich diet”2 is wildly popular with the processed pet food and “dogs are omnivores, not carnivores” crowds. It has become their bible, providing “proof” that dogs should be eating starchy, carb-heavy diets instead of protein-rich animal meat-based diets. The author’s point is valid: dogs are not wolves. However, the fact remains that dogs are a subspecies of wolves: Canis lupis familiaris — the familiar (i.e. domesticated) wolf. Dogs Can Adapt to Biologically Inappropriate Diets. Does That Mean We Should Force Them To? A friend of mine, holistic veterinarian and author Dr. Doug Knueven, did a careful analysis of the study when it was published back in 2013 and debunked the results. [Little Big Cat also debunked it, right here.] The study authors — a group of geneticists in Sweden — approached their research with a commonly held bias that “dog food is good for pets.” As Dr. Doug points out, when you start a study with a bias, it tends to skew your results. All the study validates is that a dog’s body has some capacity to adapt to the food it eats. It certainly doesn’t prove that it’s good for dogs to have more starch in their diet. And I certainly don’t want to encourage people to feed biologically inappropriate diets because their pet’s body will adapt. I want people to feed their pets what nature designed them to eat. Then their bodies don’t have to work to adapt to their diet. The study does show there are genetic differences between dogs and wolves, which shouldn’t be a surprise to anyone. Dr. Doug points out that dogs are undergoing an evolutionary process, but what some people might not understand is that no individual dog evolves. Feeding dogs a starch-rich diet won’t cause them to evolve to change their genetic code to be able to handle it better. The way evolution works is, there are certain “mutant” individuals — let’s say a group of dogs that have a mutation that allows them to digest starch better than most dogs. Those individuals will adapt to better process a high-starch diet. They will reproduce, which means the mutated gene they carry will become more common in the future; their offspring may also process starch more efficiently. But all the rest of the dogs will continue to not do well on a high-starch diet. The dogs with the mutated gene can survive on it, but the “non-mutants” don’t do well, and that can lead to problems, including the biological consequences of feeding an inappropriate, high-starch diet to a carnivore. The study authors didn’t address what happens after the glucose in high-starch diets hits the dogs’ systems, triggering a cascade of inflammatory processes. I don’t think the epidemic of inflammatory diseases plaguing pets today can be discussed without accepting the fact that the food most people feed on a daily basis is a significant contributing factor to the diseases their pets are diagnosed with. It’s clear the highly processed “food” the vast majority of people serve their pets is negatively impacting health. Do We Want Our Dogs to Thrive, or Merely Survive? Cats are obligate carnivores and dogs are scavenging carnivores. Dogs can certainly tolerate a higher amount of dietary starch than cats, but it’s still a metabolic stressor for them, including hormonal fluctuations. And sadly, the pet food industry appears to also be testing the waters as to how much starch cats can tolerate, which is the exact opposite approach the industry should be taking if they want to use food as medicine. Unfortunately, many people assume that since dogs aren’t strict carnivores like cats are, they can easily transition to a vegetarian or even a vegan diet. In fact, I often hear dogs referred to as omnivores, which simply isn’t correct. Dogs’ taxonomic classification is Canis lupus, in the order Carnivora. They are in the same family as their cousins, gray wolves. Just because a dog manages to stay alive on plant-based foods doesn’t make him an omnivore. What research does show is that if dogs are fed a grain-based diet for decades, over time they develop the ability to process some starch. This is called an evolutionary adaptation. It’s a good thing these adaptations occur, because if animals didn’t adjust to some degree to changing environments and the species-inappropriate diets they’re fed, they would die off in large numbers and ultimately become extinct. The good news is dogs can upregulate their amylase production, which is the digestive enzyme necessary to process starch. If you feed dogs a starch-based diet for several generations they will adapt to produce more amylase, but that doesn’t mean the diet is a biologically appropriate source of nourishment. Animals’ teeth are specifically created for the food they are born to eat. Your dog’s teeth are designed to rip, shred and shear flesh off bone. Dog molars are pointed, not flat. Humans, who are omnivores, have molars that are large and flat because they’re designed to grind up plant matter. If you look at the teeth of other omnivores and herbivores, you’ll see big, wide and flat molars designed to chew plant matter. Your dog has no flat molars because nature didn’t intend for him to eat much in the way of plant matter. He also has powerful jaw and neck muscles that aid in pulling down and consuming prey. The jaws open very wide to accommodate whole chunks of meat and bone, and move only up and down (not side to side), because they are designed for crushing. In contrast, omnivores and herbivores have jaws that permit the lateral (side-to-side) motion necessary for grinding plant material. The carnivore’s stomach is short and simple in design, and also very acidic. It’s meant to move food quickly through, and to deal with the pathogens found in fresh whole prey, which is not clean meat. Plant matter and vegetables need more time to break down in the gastrointestinal (GI) tract, which requires a different, more complex digestive design than your dog’s body possesses. This is also why vegetarian animals tend to masticate or chew their food over and over and over. The term “wolf it down” refers to the tendency of wolves and other canines to tear chunks of meat off prey and get them into their bellies as quickly as possible. Carnivores don’t engage in much chewing at all. That’s why whole veggies, grains and seeds tend to come out in your dog’s poop looking just like they did when he ate them. His stomach isn’t equipped to break them down, so they simply travel through the GI tract intact and pass out the other end as undigested waste. Dogs also don’t make the necessary enzymes to break down carbs and starches in the diet. Omnivores and herbivores make those enzymes in abundance, but carnivores do not. Bottom line: While there are some genetic differences that have evolved between wolves and domestic dogs, it’s not an argument for feeding grain-based diets to carnivores. What Happens When We Feed Carnivores as Omnivores or Vegetarians? First, the carbohydrates that are a central feature of plant-based diets, including grains, potatoes and legumes, displace the quality animal protein necessary for a dog’s (or cat’s) healthy muscle tone and organ function. Second, all of those unnecessary carbohydrates break down into starch, then sugar (glucose), which requires the pancreas to release massive amounts of insulin on a daily basis. What science has made very clear in the past decade is the role of insulin as a contributing factor to many of the chronic diseases plaguing pets today. One of the most important things we can do to increase longevity and decrease disease potential in pets (including the risk of diabetes, obesity and cancer) is keep their insulin levels low. It’s impossible to keep insulin levels low when feeding a high starch diet. Feeding your dog as an omnivore or vegetarian means he’ll inevitably have more inflammation and insulin release than dogs fed a biologically appropriate (low-carb) diet. Exactly how these health stressors impact your dog’s body depends on how resilient he is (factoring in variables such as genetic predisposition, stress level, exercise and environmental chemical load). But here’s where common sense reigns: you can’t feed inappropriate foods and expect an appropriate health outcome. Dr. Anna and her team at DogRisk recently completed research looking at what happens to the levels of homocysteine (a blood marker correlated to chronic disease and inflammation) when kibble-fed dogs were weaned onto raw food for three months. There was an 81 percent decrease in disease blood markers. 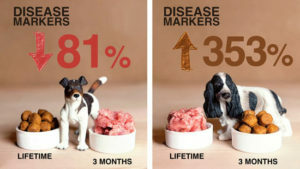 Likewise, when raw fed dogs were put on dry food for three months, there was a 353 percent increase in disease markers. As more and more of these types of independent studies are released, we can look forward to more pet parents waking up to the deceptive marketing practices the pet food industry has relied on over the past several decades, and making more species-appropriate food choices to help intentionally create health in their pets.